Do you object to the clicking of keyboards that interrupt courtroom proceedings? 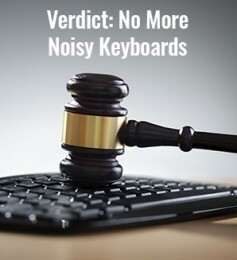 Then you should rule in favor of the noise-free court keyboard from Man & Machine. With minimal mechanical parts and keys that press silently, the Really Cool Keyboard can be your stealthy accomplice in the courtroom. With excellent tactile feedback, its sealed, seamless body can be washed and disinfected without fear of failure. 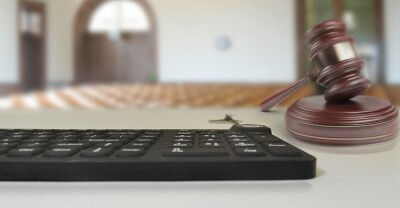 Our premium line of keyboards come in a variety of form factors, so you will find the perfect fit for any defendant’s, plaintiff’s or clerk’s table, podium or judge’s bench. We also offer the D Cool keyboard, a lower cost alternative that is also a sealed and silent keyboard. Judge’s know that a quiet courtroom commands respect. 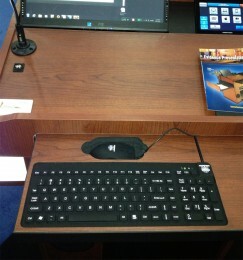 A quiet keyboard lets you research judicial precedent or message court staff without affecting the mood of the courtroom. Keep your courtroom focused and peaceful with a quiet keyboard from Man & Machine. Courtrooms are high traffic areas where germs are easily passed around. Help stop the spread of illnesses and sick time with washable keyboards. Studies show that keyboards are often the nastiest peripherals in the workplace. Hand hygiene is one of the most effective and low cost ways to prevent the passing of infections from person to person. Our washable keyboards are easy to wash and a pleasure to type on. Typing in low-light environments is easy and hassle-free when you use a Really Cool keyboard with optional backlight. The multilevel backlight add-on lets you choose the perfect level of brightness. With built-in LED’s behind every key, simply tap the backlight button until you find the exact level of brightness for your environment. Proudly born in the USA, Man & Machine’s premium keyboards, mice and other devices are assembled and tested by our team of highly skilled workers in Landover, Maryland. Built with quality in mind, our keyboards have a superior keystroke rating. Our products are 100 percent quality assured and are built to last. From the economical D Cool keyboard to a top-of-the line Really Cool keyboard, we have the quiet keyboard for every budget. Judge for yourself by selecting the Man & Machine keyboard that is right for you.